Temps reached record highs in Little Rhody yesterday, and as I sat in my air-conditioned office in Boston, I knew there was no freaking way our planned Wednesday night dinner was going to happen in our not-yet-air conditioned carriage house kitchen. I wasn’t inclined to cook at all, in fact, and began a mental inventory of fridge and pantry to try to figure out my game plan. I love a big salad for dinner on a sweltering night, and it wasn’t long before I had a few good candidates in mind. We’ve always got the ingredients for what we call an “indoor picnic” on hand – good cheeses and cured meats, tinned fish, olives and other brined and pickled things, but our fresh vegetable options were somewhat scarce, and a special trip to the store was out of the question. 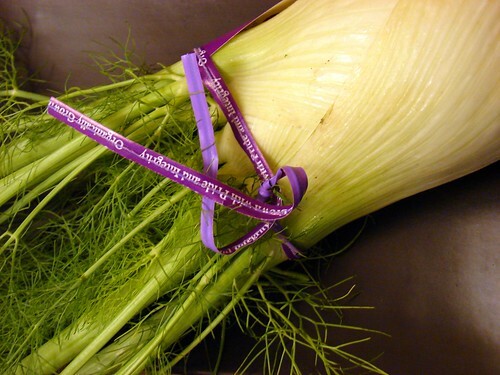 I did have a big bulb of fennel in the crisper, and decided to use it as my base and go from there. In the end I went with something that was a little bit like an antipasto salad, with shades of giardiniera and panzanella thrown in for good measure, a crisp-crunchy-tart-tender-tangy melange of shaved fennel and red onion, lightly pickled cauliflower and carrots, roasted red peppers, capers, chunks of Crespone salami and Parmagiano Reggiano, and garlicky homemade croutons, all in a zippy red wine vinaigrette. 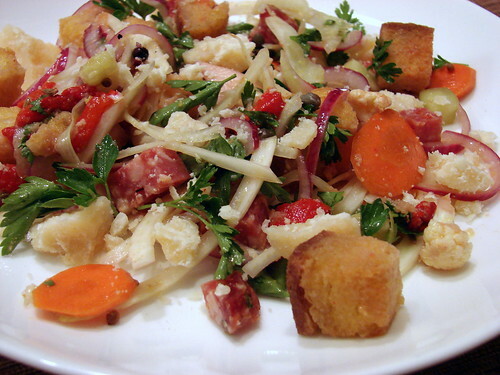 This salad was surprisingly hearty, but the crunchy texture and the brightness of the flavors kept it from feeling heavy. Best of all, I got it on the table without breaking a sweat. Yum, that looks tasty. The A/C was running in our place last night, but we have yet to install a range hood for the stove (been meaning to do it for a year now), so it was watermelon and an english muffin with melted sharp cheddar to the rescue (yay for the toaster oven). Not nearly as glamorous or pretty as your dinner, but I didn’t break a sweat either! 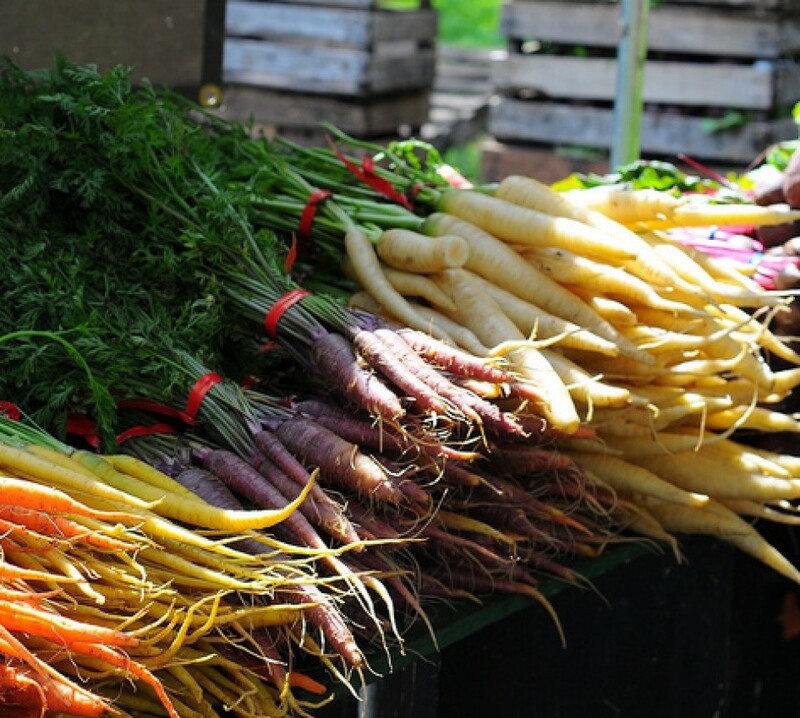 How long did you pickle the veggies? 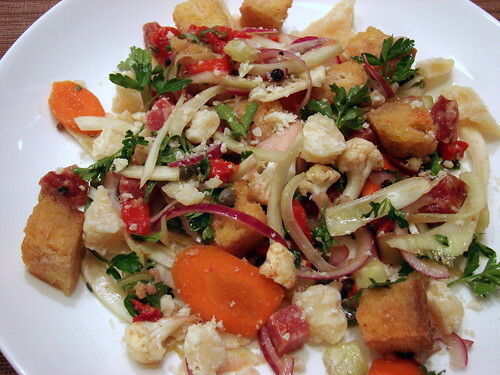 I heart bread salad season. Jen, this looks fabulous. JR and I spent the last two nights on the back deck with prosciutto, cheese, and watermelon (Adina and I clearly had the same idea!). Oh, and wine. Always with the wine, of course! Hope your container garden is coming along nicely & enjoyed the overnight drink of water. I know we were glad for the relief from heat. In May. Yum. LOVE to see salad inspiration. We did an indoor picnic last night too–there was just no way dinner was going to be anything beyond assembly. this looks amazing. 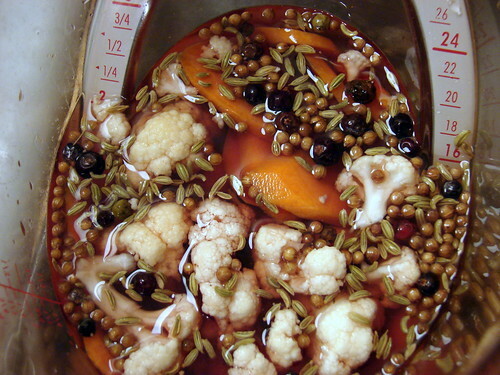 did you do the pickling the same night that you ate? Lordy! I covet your salami. Adina – I can’t tell you how many times I have missed our toaster oven. We must have left it behind in our move from Brooklyn, and it would be so welcome on balmy nights or when we just need to heat something small. Ah, well. As for the pickles, they sat in the brine for a couple of hours. Maggie – I love an indoor picnic any time of year, but it’s especially welcome on nights like last night! erin – I did! I do a lot of quick pickles when the weather warms up – they’re such a fun and easy accompaniment to or component of all sorts of dishes. Mrs. Larkin – it’s really, really good. We have an incredible cheese shop in town whose staff curates amazing meats and cheeses. 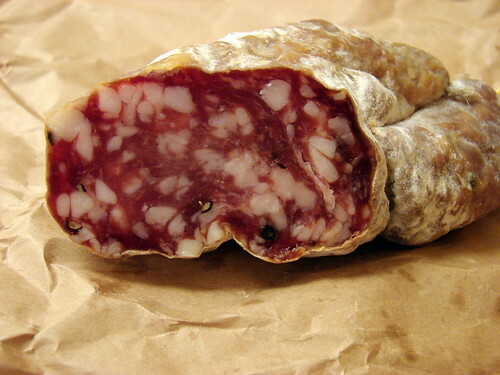 This Crespone comes from Columbus Salame Company in San Francisco, and it’s well worth seeking out.